On our way out of the Cinque Terre we stopped in Lucca. Lucca is a nothern Tuscan village surrounded by a wall that wraps 2.5 k around the city. 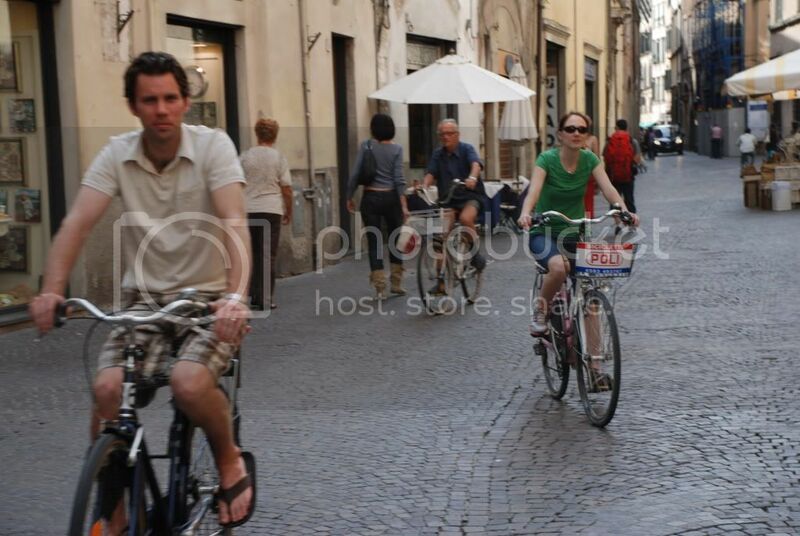 We rented bicycles and rode atop the wall and within the city. It was wonderful. There are very few cars, so we wandered through the streets and window shopped, took pictures, and marveled at how much ground you can cover on a bike. I don't know when I've had so much fun. Ryan and I may move there. There are plenty of locals and I'm sure they need a pediatrician and a...um, whatever it is that Ryan does. That sounds like heaven! Really. Did you catch a glimpse of San Giminiano? So jealous! Ryan is THE BEST tour guide. I hope you two have a wonderful time. If you ever eat at the 4 Seasons Restaurant in NYC (Park and 52nd) Julian the manager is from Lucca. LOVES talking to people about it. did i mention i'm slightly jealous?